Playing Safe with Pokemon GO! First, and the game tells you this pretty much every time you start it – always be aware of your surroundings! Pay attention to where you are walking and what is going on around you, and don’t walk around just staring down at your phone. Ditto doesn’t even look at his phone while he’s playing, unless he gets an alert that there is a Pokémon or Pokestop in his vicinity – the game will vibrate and give an audio alert when either of these things happen, so you won’t miss them even if you’re looking around you and not staring at your phone. If you are tracking an elusive Pokémon using the ‘footprints’ count in the nearby Pokémon system, just look every minute or so – the footprints count doesn’t change that rapidly, so you really don’t need to stare at it constantly to track the Pokémon. Hello Everyone – Ditto wants to wish all his friends and fans a very happy and safe Halloween!!! 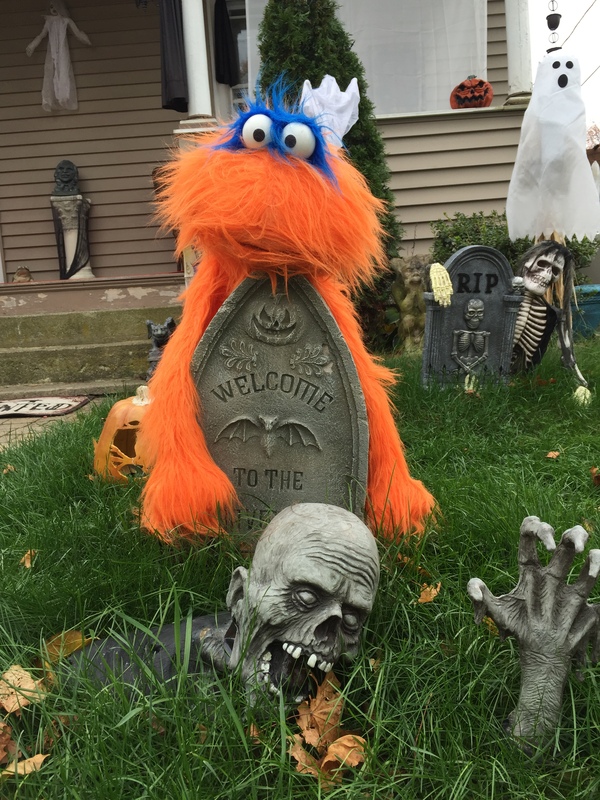 Ditto is getting his spooky on, as Monsters love to do, and decided to share a few pictures too! Ditto and Chip Play Outside! Playing video games is definitely lots of fun, but it’s a lot of fun to do other things too… See what it takes for Chip to convince Ditto to stop playing his new game and enjoy having fun playing outside!! Playing outside and being active isn’t just fun, it’s really good for you! Ditto and Chip – Let’s Play Outside! Chip: Hey Ditto, want to go play outside? Ditto: No, me playing a new video game, it’s really fun. Maybe later, OK? Chip: Aw, but it’s the first sunny day we’ve had in a week – wouldn’t it be more fun to ply outside? Ditto: Maybe later Chip, OK? Me playing a game..
Chip: Hey Ditto, want to try a fun new game? Ditto: New game? Ooh, yeah – what kind of game? Chip: It’s a physics-based action game – you need to move your ‘avatar’ properly to play. Ditto: Oh that sounds fun! Me love physics games! What’s the website? Chip: There’s no website, this game needs… specialized hardware. Follow me! Next scene – Ditto and Chip are outside playing on the swings. Ditto: That was pretty clever, Chip – you’re right, this is lots more fun and it’s a really nice day! Chip: Yeah, it’s a lot more fun, and healthier too! Yay! Ditto: Yay, wind in my fir, wind in my fur!! Keep your information safe online! Mister Crimp offers Chip ten thousand points to his favorite online game – but there’s a catch! He’s asking Chip for his account information and other personal info, which isn’t safe! Ten thousand game points is very tempting – will Chip do the right thing? Chip and Mister Crimp – keep your information safe online. Chip has a problem – someone said some really mean things about him on Facebook, and he wants to get back at them, so he goes to Ditto for help. Ditto and Chip talk about the best things to do when someone is being mean to you online. If someone is bullying you online there are lots of ways to get help, like parents and teachers, moderators and online community representatives. Hi Everybody – Ditto here, and for this week’s video bloggy thingy I wanted to talk about something I call ‘Bullying by commenting’. Ditto prepares for Hurricane Irene! We are listening to the radio and watching television and looking online for weather updates and evacuation orders. We have a place to meet in case we get separated during the hurricane. We made sure we have some water and non-perishable food stored (that means food you don’t have to refrigerate or freeze), just in case we lose water or power during the storm. We have candles and flashlights with fresh batteries, also in case we lose power. Being in the dark during a storm can be very scary, so having several sources of emergency light is a good idea. We are bringing in outside furniture and lawn ornaments – you don’t want to see what a lawn gnome can do to your house in 90 mph winds!! We made sure we know where our nearest evacuation or emergency center is, and know a couple routes to get there in case roads get blocked. If you don’t need to evacuate, be sure to STAY INDOORS during a hurricane. You could be hit by flying objects or be knocked over or hurt by strong winds. Don’t be fooled if there is a pause in the wind. It could just be the eye of the storm, and the winds will come again, and could come up suddenly. If you do evacuate, do NOT go back home until local officials say it is safe. Finally, Hurricanes are serious, make sure if you’re a kid, you listen to your parents and take things seriously, so you can stay safe. You can get even more information about preparing for serious weather events and more at the FEMA For Kids website.